Trust; it’s the foundation for any kind of prosperous relationship. Trust is difficult to gain, but extremely easy to lose. Without it, no connection or partnership can successfully grow or evolve. Here at TimeXtender, we take our partnerships very seriously. Our partners are an integral part of our infrastructure and a vital piece of our community. Beyond passion and shared goals, trust is what binds us together, making our relationships not just strong, but resilient. You might have heard me reference the 7 Habits of Highly Effective People in any number of my presentations, articles or personal conversations. One of my most prized habits, that I ensure carries throughout our company, is that of always ‘Thinking Win-Win’. ‘Thinking Win-Win’ doesn’t just mean being cordial or being fair, it represents a way of working where value and respect for others allows you to find the ‘win’ for both you and your partner. A win for all will always trump a win for one. ‘Thinking Win-Win’ leads to stronger, long-term solutions, those that foster collaboration, growth, and trust. Not to overshadow Stephen Covey – author of the 7 Habits – but I like to think that here at TimeXtender, we create Win-Win-Win solutions: Wins our partners, our customers and for us. I believe that there are enough wins for everyone, and when we think in this way, possibilities for success are endless. TimeXtender is here for you, for our partnership, for the win-win-win. Our goal is to form strong connections while guiding our partners and customers to success. In the spirit of creating trust, with shared goals and shared investments, I’d like to share a video highlighting one of our newest partnerships with Porsche SuperCup Driver, Mikkel O. Pedersen. 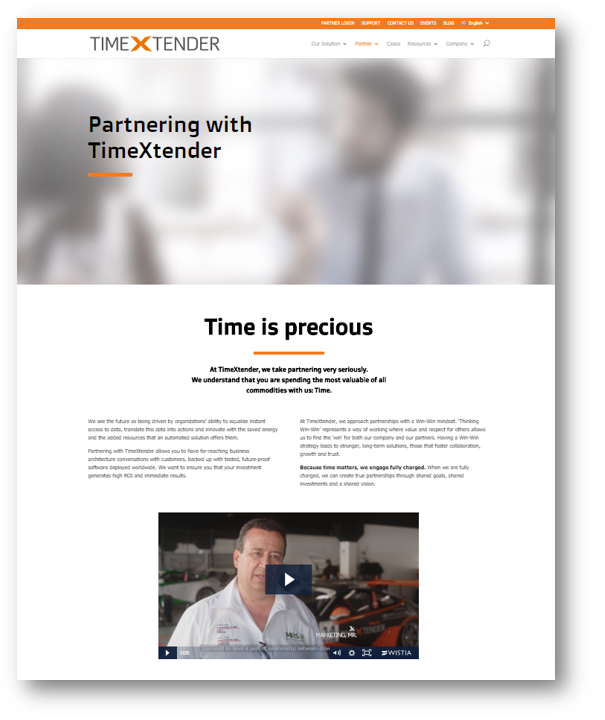 You can find the short clip on our TimeXtender Partner Page. I consider this video to be a perfect example of how true partnerships can come together. I hope you also find this video inspiring, and I welcome you to share it with your community and those you partner with. Because time, trust and partnerships, matter.